Automatic gate systems increase the security of your property while enhancing value and the look of any exterior. 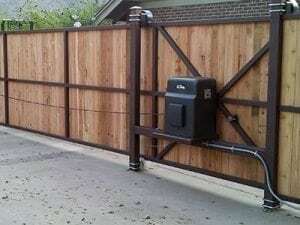 At A Straight Up Fence Company, we fabricate gates using heavy-gauge steel and durable hardware. They’re also powder coated and come in multiple colors and styles to coordinate with your home or building. We specialize in swinging and sliding gates depending on your needs and property. Along with adding security, this is a great way to create a distinguished look for any property. From the fabrication in our shop in Denver to the installation at your home or business, we’d be honored to work with you on your dream fence or gate. Solar Automatic Gate Systems: With the current popularity of all things solar, there is often a big upfront price to pay for eco-friendly devices. At A Straight Up Fence Company, we help to lower the cost barrier by installing automatic gate systems with 7-watt solar panels that can be doubled to provide 14 watts of power. Electric Automatic Gate Systems: Gates come in many different designs and opening options including single out-swing, single in-swing, double in/out swing and sliding. And openers can be used on any material – wood, iron, chain link or vinyl. These gates require a conduit to be run from the gate motor to your electrical panel, which could affect project complexity and cost. To complement our automatic gate systems, we also offer a line of accessories including safety devices, loops, radio controls, transmitters, keypads, keyless entry systems and telephone entry systems. Wherever you live in Denver, Boulder or across the Front Range, A Straight Up Fence Company will help you create a stylish and secure entry to your property with our automatic gate systems. Whether you go with electric or solar, we’ll make sure you get a gate that fits your needs and budget.